Barbara Roux, Torn Branch, color print, 2004. Each day brings more alarming news about our environment. This is no time for formal subtly. Barbara Roux has worked for over 25- years time to develop an esthetic in this fertile yet endangered terrain--the human relationship with the natural world. Using a variety of mediums, Roux brings a personal relationship with conservation into focus with Acts of Nature, a recent series of 10 ink jet prints from C-prints. Her process is grounded in the philosophy that embracing the diversity within natural ecosystems leads to an understanding of humanity. Indeed, she was taught a reverence for nature by her father, a pharmacologist and amateur botanist who did research in the Amazon for many years. The challenge is integrating a consciousness of the precarious state of our environment with an esthetic formalism capable of conveying an urgent message without being didactic. 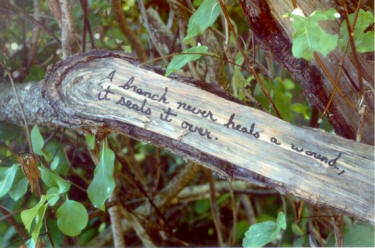 Her bold imagery frequently conveys messages directly on the surface, through writing on tree stumps and branches. However, such an overt convergence between human and nature does not carry direct meaning, leaving space for personal involvement by the viewer. Roux's imagery therefore contains this implicit knowledge: if we can be lured into the mysteries of nature, we may also be moved to protect what is in danger of being destroyed. The most powerful visual message is relayed through the juxtaposition of Hemorrhage, in which a red blood like substance is emitted from a hole in a tree trunk, with Torn Branch on which is written: "A branch never heals a wound, it seals it over". Here we find a metaphor for our treatment of the environment: nature is hurting with wounds that may be survived but never forgotten.